When in Frankfurt, take the opportunity to visit one of the largest natural history museums in Germany, the Naturmuseum Senckenberg (Senckenberg Natural History Museum). Team members at Everything Dinosaur did just that, visiting the museum just prior to the commencement of a major refurbishment programme. The spacious dinosaur gallery is perhaps, the most popular gallery in the museum and it is certainly worth a look around, but in addition, there are plenty of other gems to spot amongst the extensive collection of The Senckenberg Research Institute. A well-known Frankfurt landmark. The T. rex outside the Naturmuseum Senckenberg . With a life-size replica of T. rex to be found opposite the main entrance, visitors to the museum will not be surprised to discover that a cast of Tyrannosaurus rex can be found in the ground floor dinosaur gallery. The near forty-foot long replica positioned on a landscaped area over the road from the entrance to the museum, is in very good condition, given the amount of attention the Frankfurt T. rex was getting from young dinosaur fans who were delighted to get up close to the statue and run between the Theropod’s giant legs. Although the gallery is quite large and all the life-size dinosaurs that occupy the floor space are mounted on raised platforms, visiting the gallery later in the afternoon, affords the visitor the best views as towards closing time the galleries are much less busy. For us, a highlight of the dinosaur gallery was being able to view the marvellous Bob Nicholls replica of Psittacosaurus, the dinosaur featured in a recently published scientific paper that examined the idea of counter shading in forest dwelling dinosaurs. This beautiful model demonstrates how our views about the appearance of dinosaurs has changed. Contrast, for example, Bob’s remarkable replica with some of the painted images of dinosaurs that occupy the walls of the dinosaur gallery. A model of the dinosaur called Psittacosaurus. 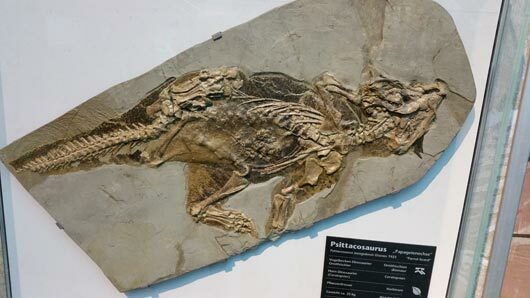 The beautifully preserved fossil Psittacosaurus specimen that was used in the recent study into dinosaur colouration can be found in the Senckenberg Research Institute’s vertebrate fossil collection. The fossil probably came from the Yixian Formation of Liaoning Province (north-eastern China), most likely from an illegal smuggling operation. However, the specimen was purchased by the Frankfurt museum (see photograph below). Psittacosaurus fossil on display at the Senckenberg Naturmuseum (Frankfurt). As well as specimens of Diplodocus, Iguanodon, Triceratops (T. prorsus) and Euoplocephalus, look out for the wall-mounted Plateosaurus and the collection of dinosaur eggs. An Oviraptor and its nest. With many of the information panels written in both German and English, these thoughtful displays are most illuminating. The mammal gallery is most impressive, look out for the Quagga display (an extinct sub-species of plains Zebra), one of just a handful of specimens in the world. In the marsupial area, a Thylacine can be found, standing amongst its close relatives the Tasmanian Devil and the Quoll. A Thylacine is included in the Australian mammals part of the gallery (Senckenberg Museum). Prehistoric elephants on display at the Senckenberg Museum (Frankfurt). For the keen fossil fan, there is a substantial display of invertebrate fossils helping to get across the concept of deep time as well as explaining biostratigraphy (check out the ammonites that help to illustrate this). An entire side gallery has been dedicated to the remarkable fossils from the Messel Oil Shales. We suspect this part of the museum has been recently modernised, the displays were well lit and the many different types of animal and plant fossil from the Messel pits were thoughtfully showcased and grouped by Phyla and Orders. The atmospheric Messel gallery at the Senckenberg Museum (Frankfurt). The marine reptile gallery was also most impressive. There were a large number of replica fossils on display including spectacular examples of Ichthyosaurs, Placodonts, Plesiosaurs, Turtles and Nothosaurs. Visitors to the museum also have the opportunity to view examples of giants of the sea around today with a most informative Cetacean gallery. It was also a pleasure to see explanation panels on the evolution of the whale family along with specimens representing Basilosaurus and Ambulocetus, the Ambulocetus tying in nicely with the Messel fossils exhibit. A display explaining how marine reptiles “flew” underwater. The spectacular ancient whales gallery (Senckenberg Museum). We look forward to learning more about the refurbishment programme for this museum and whilst we appreciate there will be some disruption during this work, we recommend this museum. It is well worth a visit.